It’s just a few days to the Easter weekend and I’m declaring the 2018 cherry blossom season open! It’s early days yet, of course, and peak blossom is still a couple of weeks away, but if you’re looking for blossom right now, there’s enough around to keep you entertained. 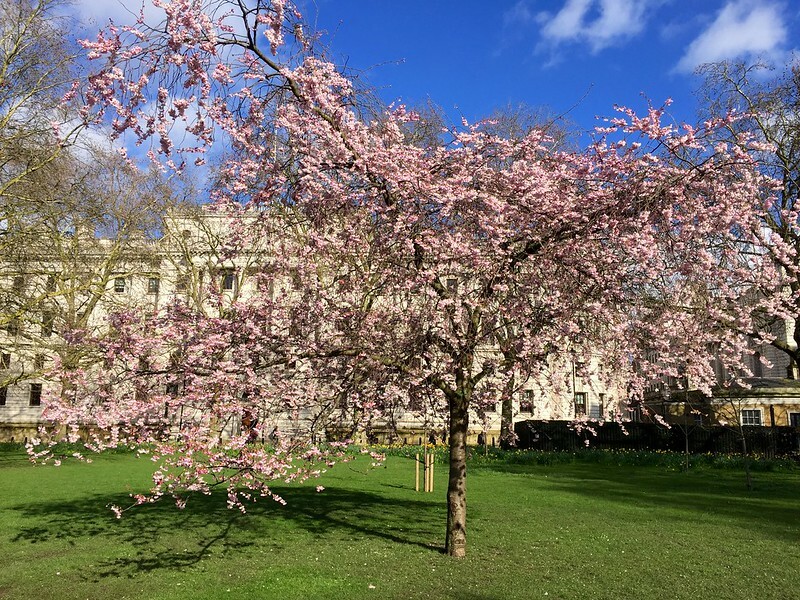 I visited St James’s Park (number four in my London cherry blossom top five guide) yesterday, to find the grove of cherry trees near Storey’s Gate in semi-bloom. They’re always among the first trees to flower and they’re a good place to get a taster of what’s to come. There are also trees in bloom at the Buckingham Palace end of the lake. Including this deep pink weeping cherry. Most of the trees along the edge of the lake have yet to flower – though this one near the blue bridge is just coming into bloom. 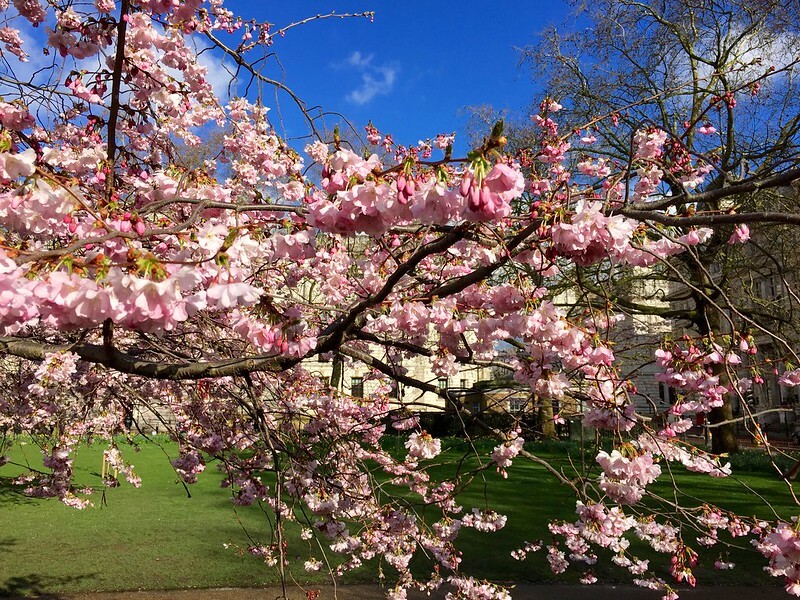 Besides St James’s Park, the early blossom in the grove at the south end of Avenue Gardens in Regent’s Park has come into flower and should be worth a visit over the Easter weekend. 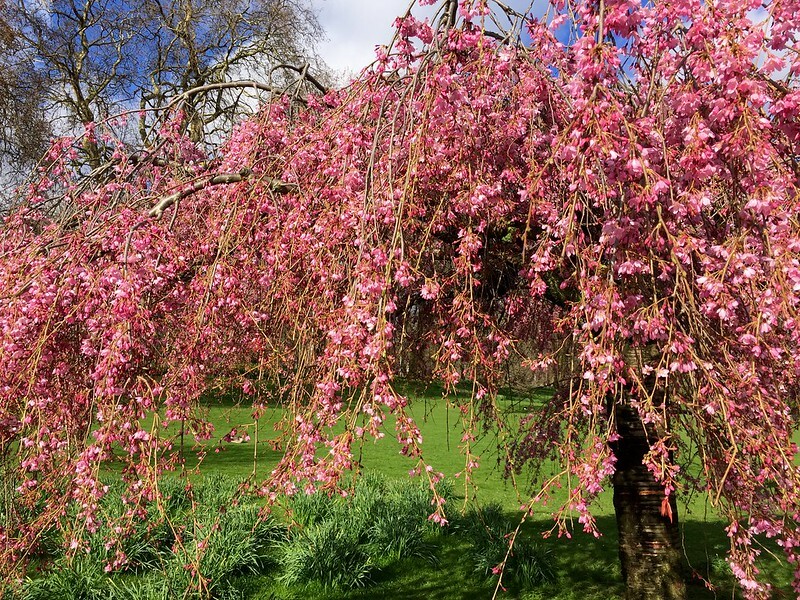 And, of course, Kew Gardens always have blossom to offer, though if you’re planning a trip specially to see the cherry blossom I’d recommend waiting a couple of weeks until the grove behind the Palm House reaches its full glory. 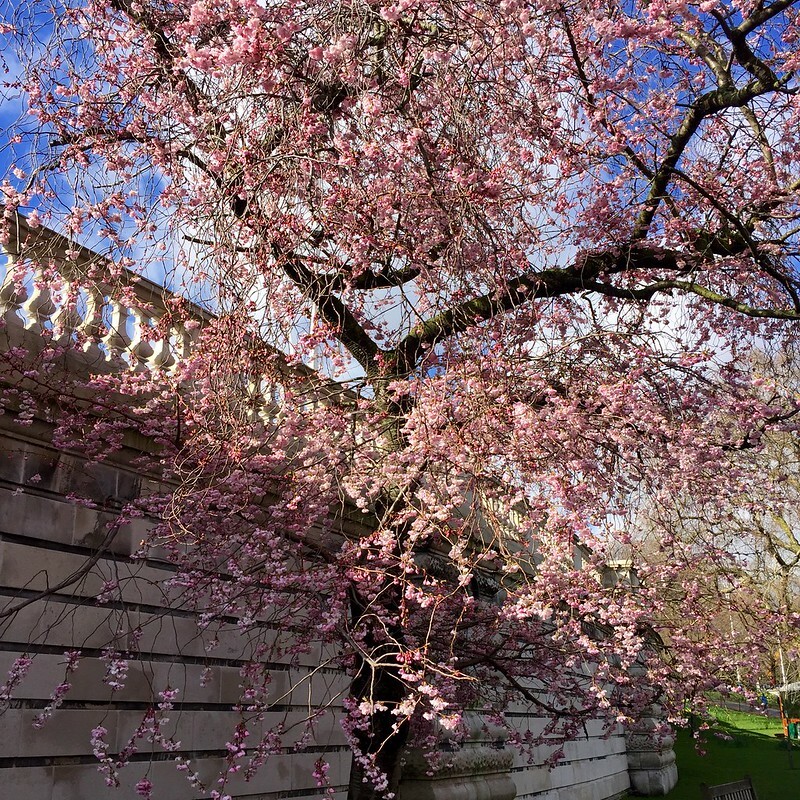 For more information about the cherry blossom in St James’s Park, visit my virtual tour. 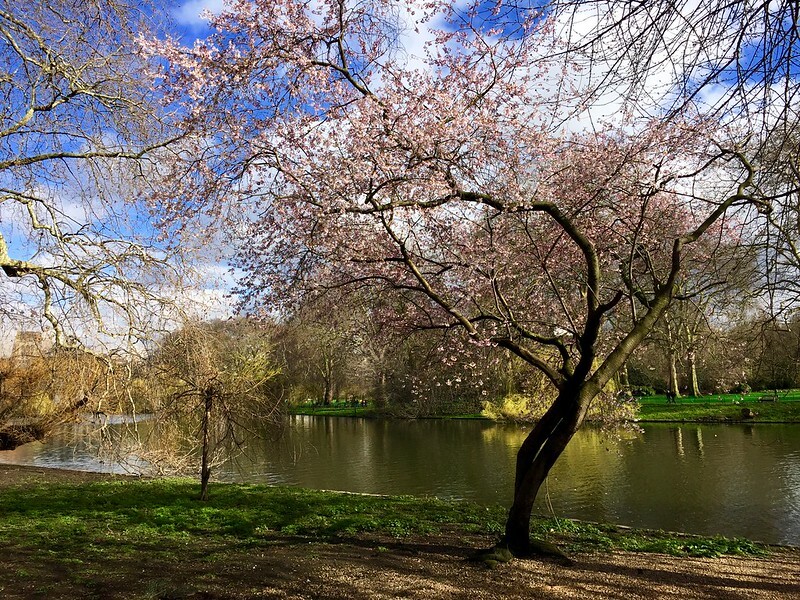 This entry was posted in Cherry Blossom and tagged flowers, gardens, London, nature, plants, St James's Park by Fran. Bookmark the permalink. Hi, some great info on cherry blossom spots here! Just incase it’s of any use to you here’s what I found on my cherry blossom search today. 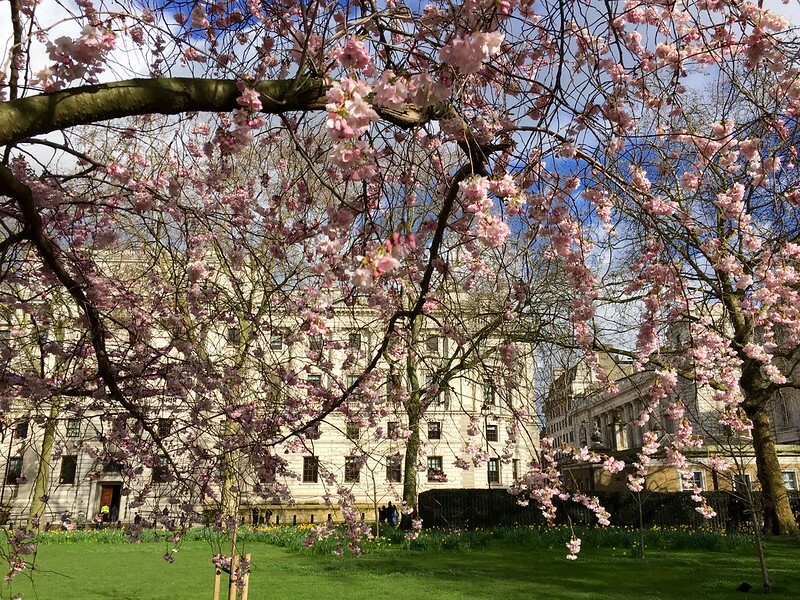 The couple near St Pauls are in bloom, as are a few at the SE corner of Regents Park, some around the streets on the way to Richmond Park, Maida Vale & Ealing areas, and of course the ones in St James Park as you mention here. However it seems a lot of them seem to already be falling/turning green, and in places like Kyoto Gardens/Holland Park it sadly looks like a lot of the buds have withered/died/fallen off completely 😦 Although there are a couple doing better and coming through a bit in some of the streets around Holland Park/Notting Hill areas. I also stopped by Linchon’s Inn Fields, no sign of any there (I’m sure there used to be), and I couldn’t find any in Hyde Park, but I didn’t go up as far as Kensington Palace/Gardens, so not sure how they’re doing that end. I’ve also been told that they haven’t come through in Greenwich Park yet (as of today). Thanks for the info. 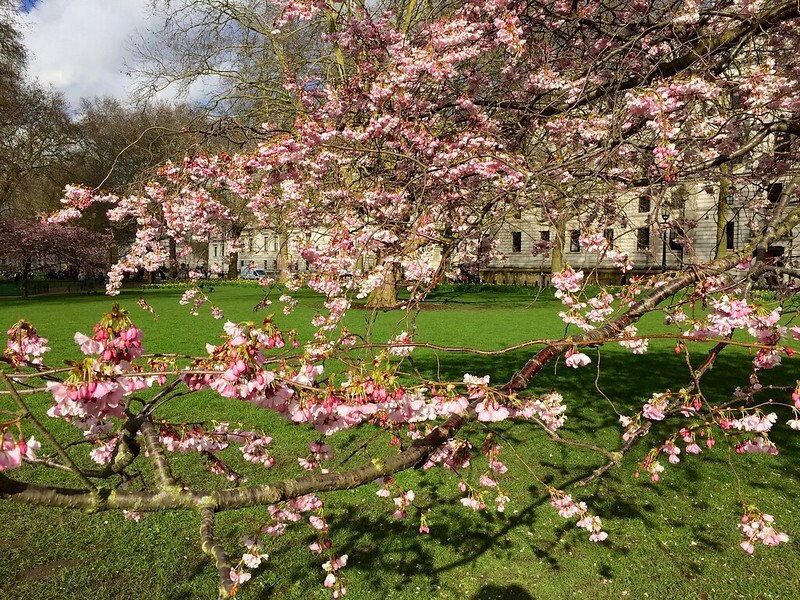 Do you reckon the cherry blossom in Greenwich Park will bloom next weekend? No, it won’t. It is one of the last places in London to bloom, so it won’t flower until late April. Try Kew Gardens or Regent’s Park. Hi there, I’m wondering if it’s still possible to catch some beautiful blooms either at St. James or Regent’s Park this weekend? Yes – Regent’s Park is your best bet. Try the English Garden, Chester Road and Queen Mary’s Garden. Should be lovely! Hi i have noticed some trees in either full or three quarter bloom in my town of Enfield. But i really want to visit greenwich park avenue of glorious trees. Are they starting their bloom yet please. I understand blackheath entrance is the nearest to the trees, is it far to walk from there. Your reply will be much appreciated. Thanks very much indeed. Its difficult to plan really given that we had a horrid wintern its only now getting warmer.